Sidney Sanders McMath was a pivotal figure not only in Arkansas history but in the history of the Democratic Party and of American law. Still vibrant and engaged in his nineties, he sets out his story in full for the first time: how he rose and fell in public office, and rose again as a lawyer seeking justice for ordinary people. McMath divides his story into four parts. In the first, he describes how his early life in rural Arkansas sparked his commitment to people. The second section describes his service to democracy in the military, including his commission in the U.S. Marines, a battlefield promotion in the Pacific and other honors, and his subsequent advancement to the rank of major general. The revealing third section details McMath’s extraordinary life in politics, starting with his explosive debut in 1945, when he and other recent veterans dethroned one of Arkansas’s most powerful and corrupt political machines. Later, as a two-term governor, he fulfilled this promise of reform and modernization: he brought the first roads and electricity to rural areas, fought the poll tax, and built the state’s first medical center. He also helped change the party’s rules so that black citizens could vote in primaries. McMath describes how he worked with President Truman to keep the segregationist Dixiecrats from taking over the Democratic Party—and the presidency. But here his story takes a dramatic turn: political opponents alleged bribery in his highway program, and although no indictments were handed down, McMath’s political career ended. Arguing his case for the first time in fifty years, he sets the facts straight. McMath turned to the practice of law to fight for the people he had represented as governor. In the concluding section of the book he describes some of his most important cases, examples of how he put his life’s experience, knowledge, and integrity in the service of those who had few resources. These stories show exactly why he has been honored with membership in such exclusive groups as the Inner Circle of Advocates as well as the presidency of the International Academy of Trial Lawyers. 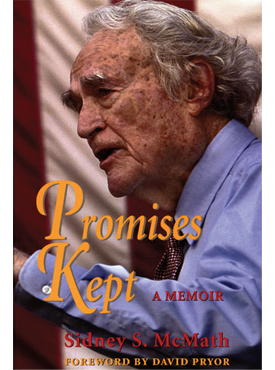 Promises Kept shows us the excitement and the hard choices of real democracy, offering compelling human stories, new information on past conflicts, and the crucial perspective of a man at the center of history. Winner of the 2006 Booker Worthen Literary Prize. Winner of the 2004 Ragsdale Award.